The Jones family’s longstanding partnership with The Salvation Army is a telling example of the creative and innovative manner in which the Cowboys can make a real difference in the world. Since 1997, the Jones family has dedicated the Cowboys’ annual Thanksgiving Day halftime performance as a national showcase to kick off The Salvation Army’s iconic Red Kettle Campaign. The team’s association with network television spawns a donation of millions of dollars in airtime every year to present nationally televised entertainment extravaganzas that have created a beloved holiday tradition. Under the direction of executive vice president and chief brand officer Charlotte Jones Anderson, the Cowboys have produced the annual halftime event and welcomed nationally renowned entertainers including Reba McEntire, Randy Travis, Toby Keith, Destiny’s Child, Sheryl Crow, Carrie Underwood, Kelly Clarkson, the Jonas Brothers, Keith Urban, Enrique Iglesias with Pitbull, Kenny Chesney, Selena Gomez and most recently in 2015, Luke Bryan. Since the first Red Kettle Kickoff in 1997, the Cowboys have helped raise over $2 billion for the Army, reaching more than 500 million people in need. In May of 2010, Anderson was named chairman of The Salvation Army’s National Advisory Board—the first woman in the history of the organization to hold that distinguished position. Until the end of her tenure in 2014, Anderson guided the efforts of the board for one of the world’s oldest and largest service organizations. Thanks to a $1 million matching donation from the Gene and Jerry Jones Family Arlington Youth Foundation in concurrence with a donation from the NFL, the Gene and Jerry Jones Family North Texas Youth Education Town (YET) opened its doors at The Salvation Army Arlington Corps in October 2013. The center, which took more than two years to complete, is the legacy project of Super Bowl XLV, providing educational, athletic and arts programs and countless other services to hundreds of Arlington youth and their families. The Jones family was joined by several distinguished guests in celebrating the center’s grand opening, including NFL Commissioner Roger Goodell, National Commander of The Salvation Army, Commissioner David Jeffrey, Arlington Mayor Robert Cluck and Cowboys Hall of Fame running back and chairman of the YET Advisory Board, Emmitt Smith. To learn more about the YET, visit http://salvationarmyyet.org. When disaster strikes, The Salvation Army is often the first on the scene to offer food, shelter, clothing, spiritual comfort and more. The Cowboys are proud to have assisted the Army in their relief efforts in the DFW Metroplex and beyond, most recently after deadly tornadoes struck two nearby towns in Texas—Granbury and Cleburne—as well as Moore, Oklahoma. The Cowboys partnered with CBS 11 and Albertsons Market to take donations through phone banks and at the grocer’s registers, raising thousands of dollars in record time. The Cowboys organization also contributed to the Army’s relief efforts after tragedy struck West, Texas in April 2013.  When a fertilizer plant explosion devastated an entire city killing 15 citizens and injuring 160, the Gene and Jerry Jones Family Foundation donated $100,000 to support The Salvation Army Emergency Disaster Services. The following June, Cowboys wide receiver Terrance Williams, Dallas Cowboys Cheerleaders and Cowboys youth football staff teamed up with the Army, the CenTex Pee Wee Football League and Baylor University to host a free youth clinic for the families and children affected by the West tragedy. in the DFW Metroplex alone, is truly a joint effort for the Cowboys, from Cowboys rookie players loading the big red bags onto the Army trucks to Cowboys employees helping distribute them to the Angels’ families. In an effort to enhance the program, the Cowboys have partnered with Bank of America and the North Texas Food Bank since 2013 to provide hardy holiday meals for thousands of families receiving Angel Tree gifts in the Dallas area. The week before Thanksgiving, Gene Jones and Charlotte Jones Anderson lead a group of players, cheerleaders, mascot Rowdy and players’ and coaches’ wives in serving an early Thanksgiving meal to families receiving assistance from The Salvation Army. Since 2012, the Cowboys have served two Salvation Army locations, with veteran players and wives at the Carr P. Collins Center in Dallas and rookie players and cheerleaders at the Mabee Social Services Center in Fort Worth. The Cowboys support the Army in numerous other initiatives throughout the year, including through the Cowboys’ and NFL’s PLAY 60 campaign which encourages kids to eat nutritiously and be active at least 60 minutes of every day. The Cowboys have installed Dallas Cowboys PLAY 60 Fitness Zones in several Salvation Army locations, including at Arlington’s Youth Education Town.